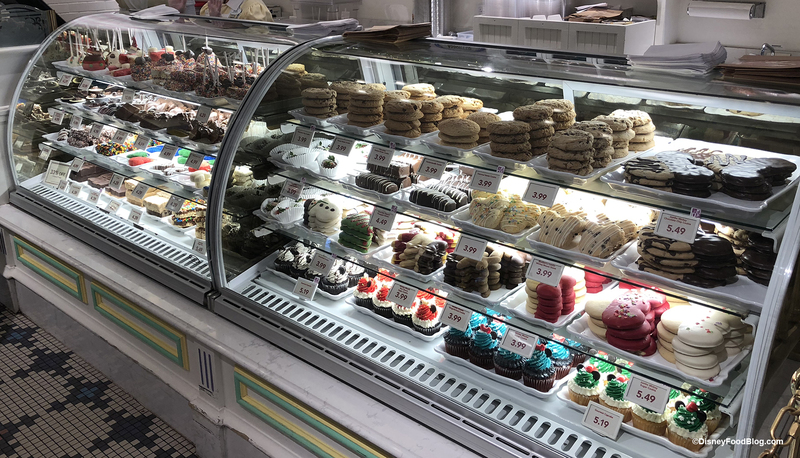 Our first sweet stop was in the Confectionery, nothing beats a gaze into the bakery cases here! 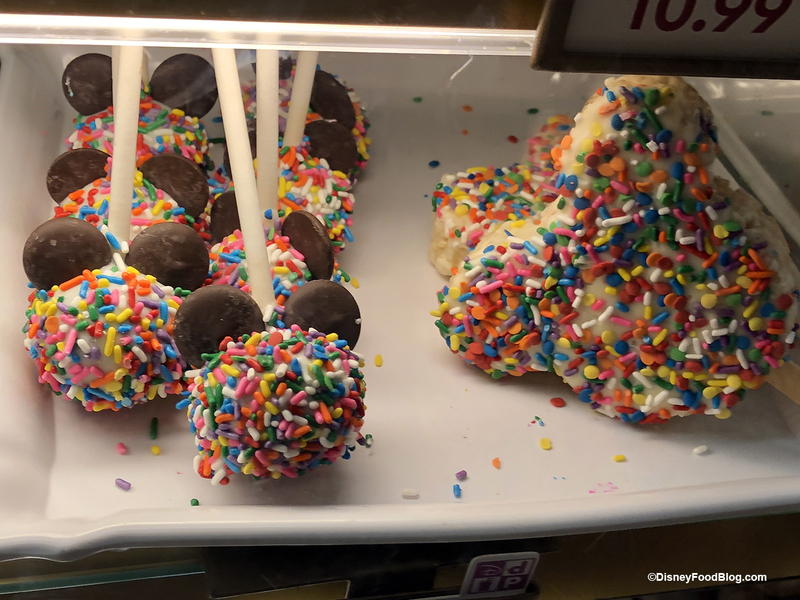 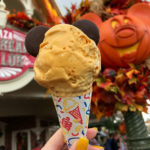 While day-dreaming about baked goods we spotted some of Mickey’s 90th birthday treats that are still being offered here, and we also found some of his birthday sweets at Fantasyland’s Big Top Treats. 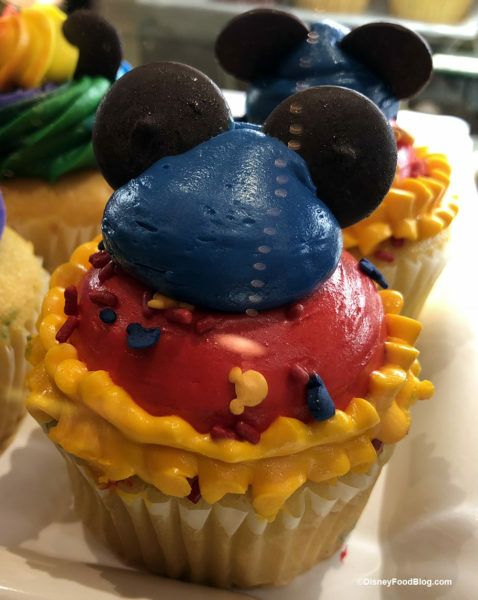 Over at Big Top Treats they have cupcakes, a three-tier krispie cake, and a cake pop to continue the celebration of Mickey’s 90th. The Plaza Ice Cream Parlor is still serving up sundaes in the perfectly polka-dotted Minnie Kitchen Sink! 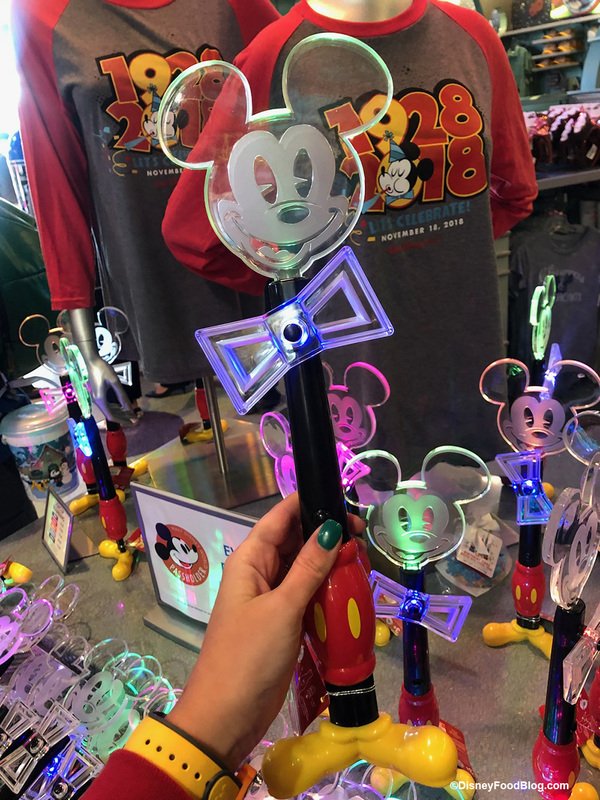 The spinning bow-tie glow wands are also still available on the merchandise carts in the park. 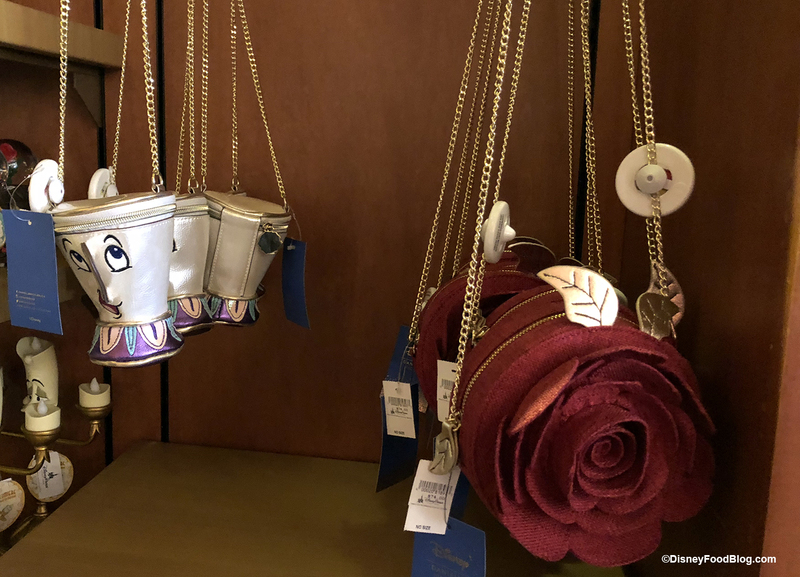 Uptown Jewelers has been home to the park’s The Dress Shop, and this stop didn’t disappoint. 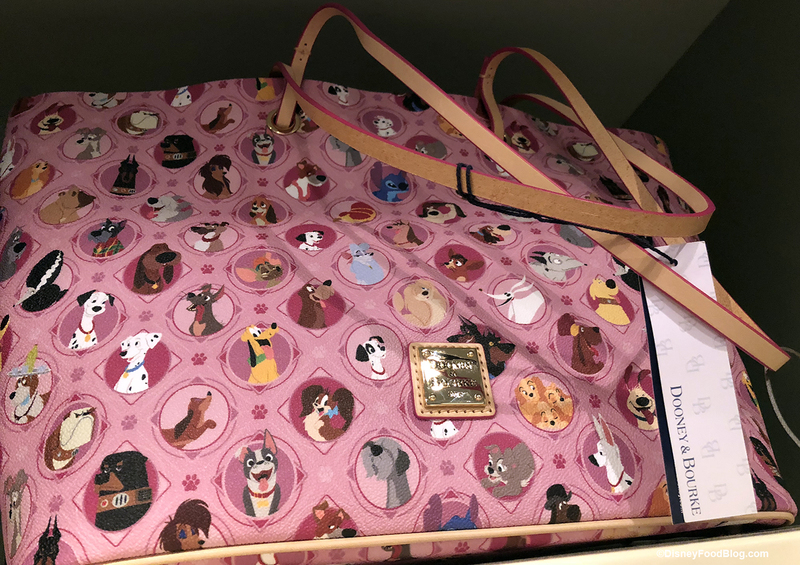 We spotted the new Disney Dogs print on a dress, a Magic Band, and a Dooney and Bourke collection. 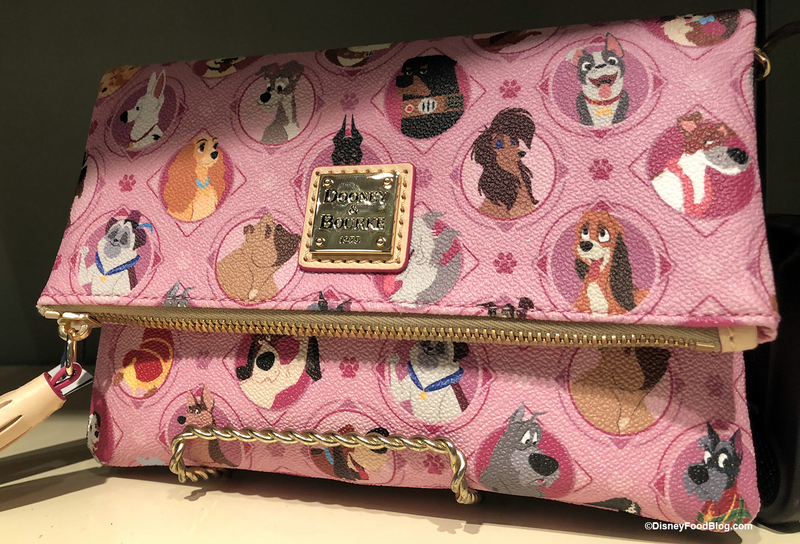 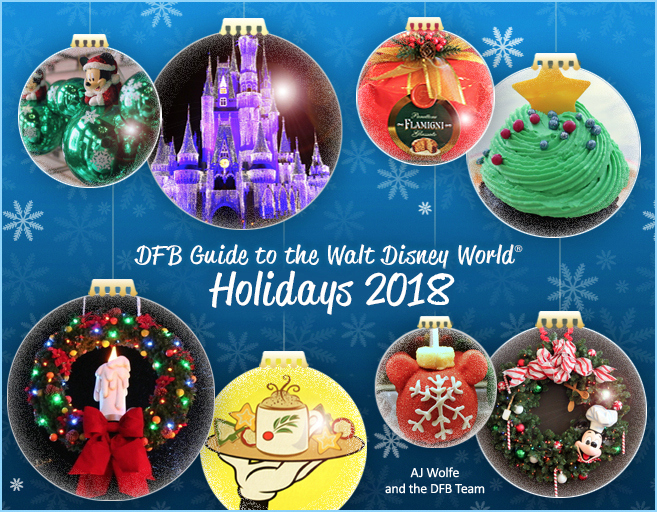 This year’s version of the print features so many Disney Dogs — the Dalmatians, Fox and the Hound‘s Copper, the Tramp from Lady and the Tramp, Up‘s Dug, and Stitch…wait, is Stitch a dog? 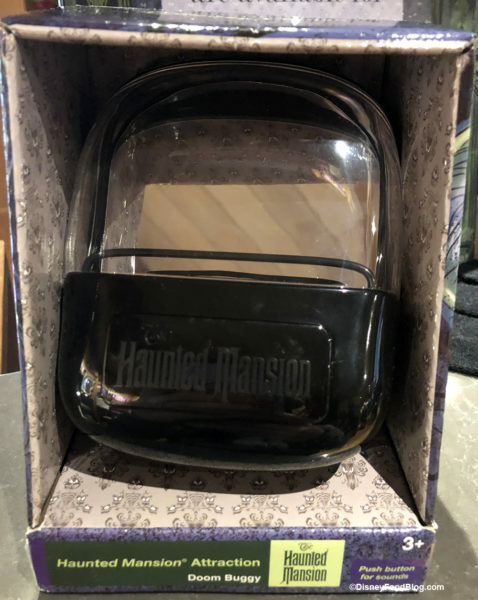 Let us know what you think in the comments! 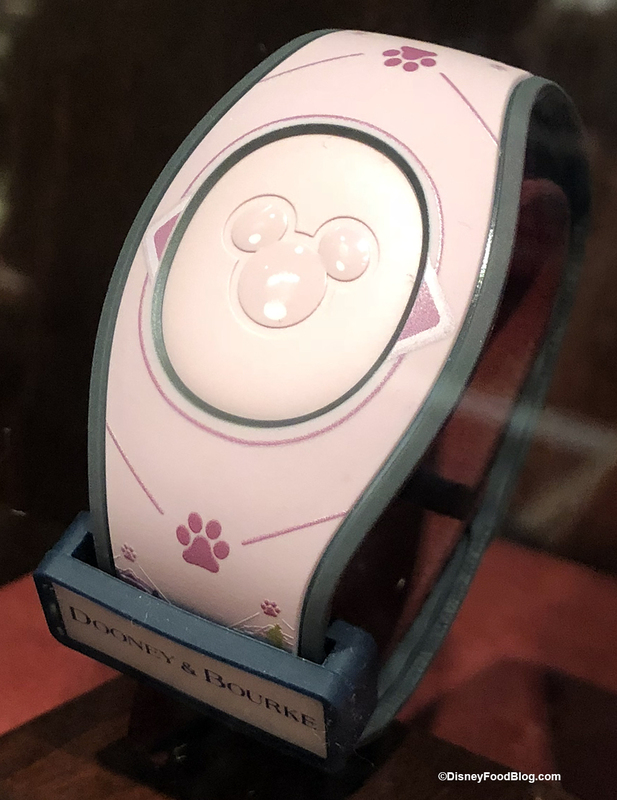 And, the perfect accessory when you’re in Disney — there’s a Disney Dogs Magic Band! 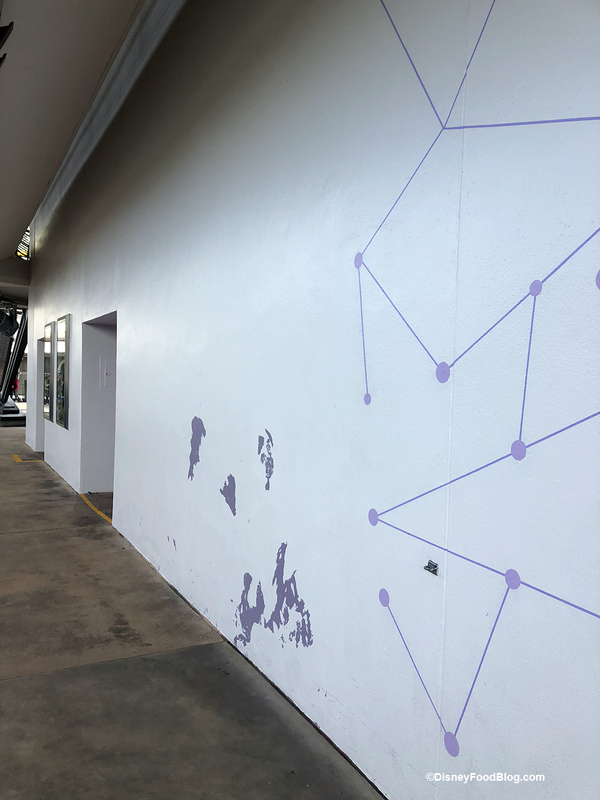 The #ShareYourEars mural has been removed from the Purple Wall. 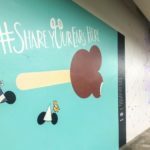 We are interested to see what, if anything, replaces the mural. 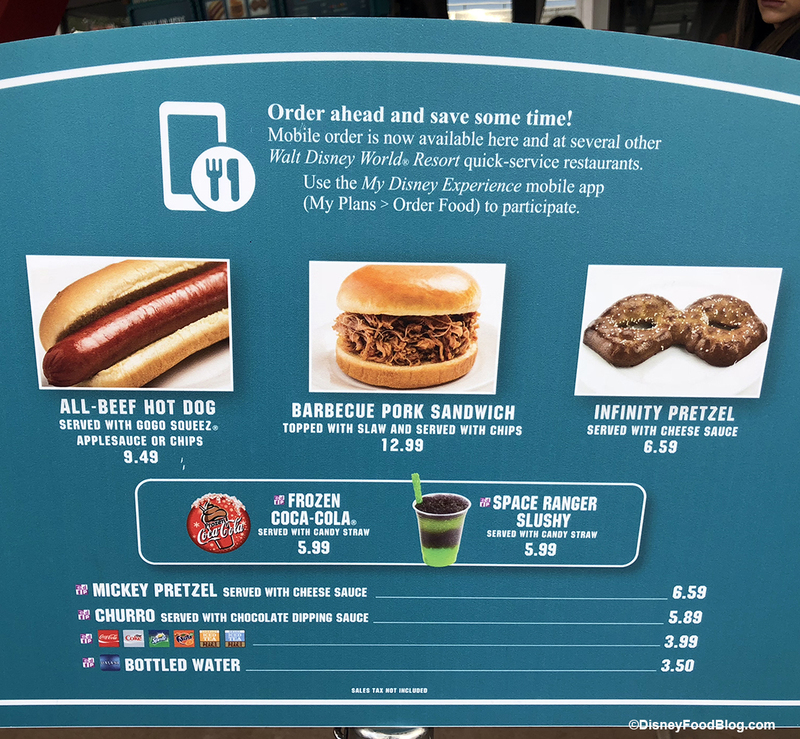 The Lunching Pad‘s Frozen Cokes now come with the same rock candy covered straws that came with our Wonderland and Space Ranger Slushies. 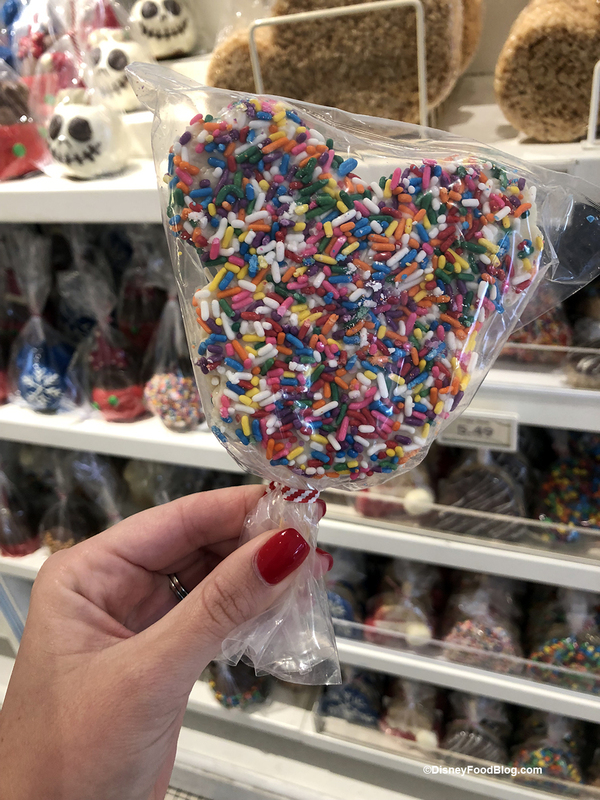 Don’t forget, the candy straws have also been added to the Witch’s Brew at Prince Eric’s Village Market and to the peppermint sundae at Storybook Treats. 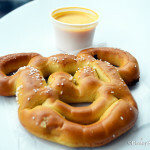 They’ve also still got the Infinity Pretzel from this past summer on the menu here. 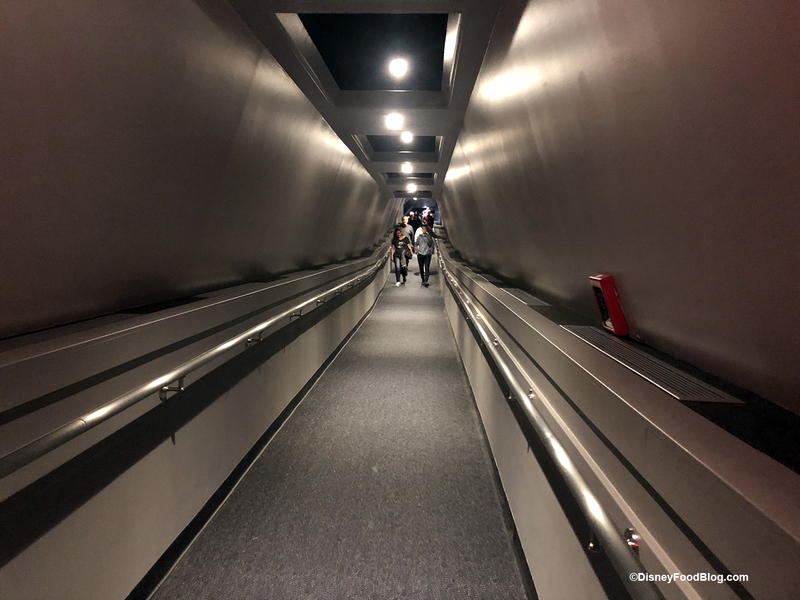 Space Mountain has a new exit! 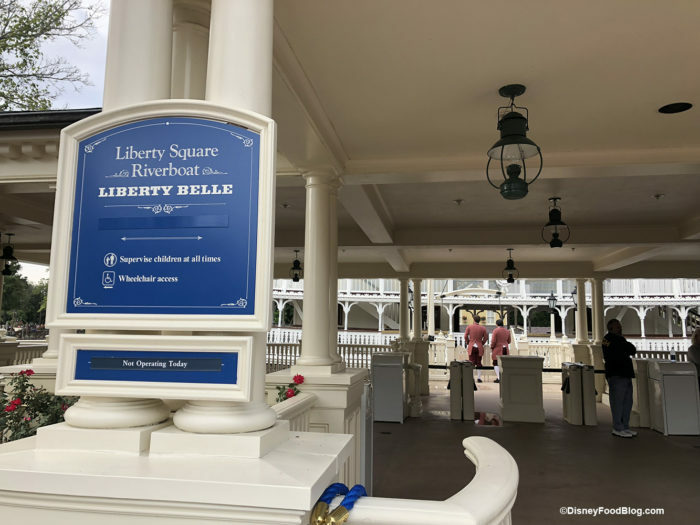 Check out all the photos of the new exit here. 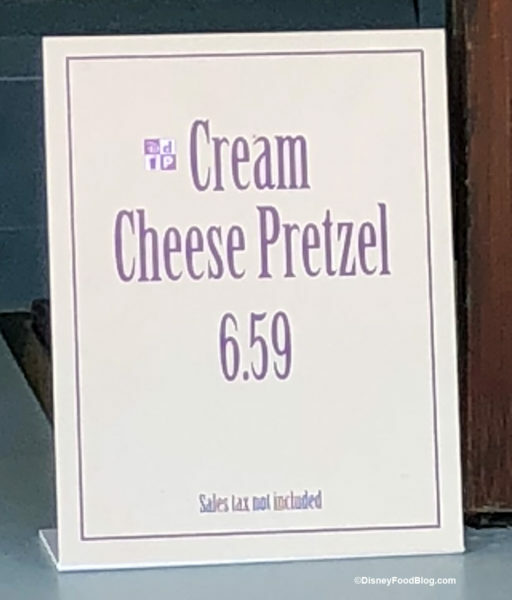 The Joffrey’s stand, Revive, in Tomorrowland is offering seasonal drinks. 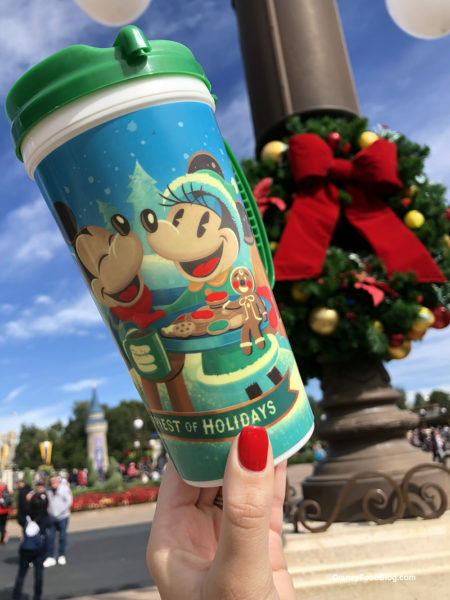 You’ll find a Peppermint Mocha Latte and a White Chocolate Gingerbread Latte here. 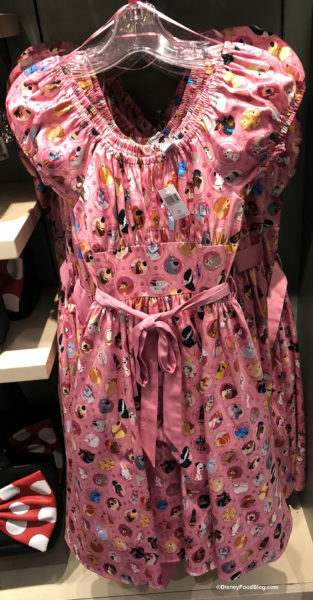 Talk about a difficult choice! Which would you go with? We think we’ll go for the Peppermint Mocha Latte. 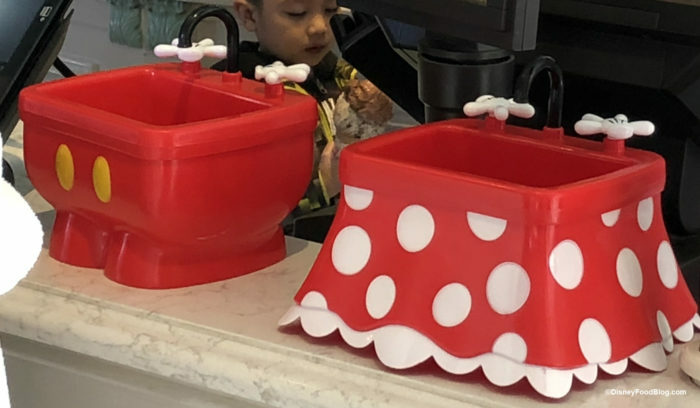 Those cute Mickey Balloon popcorn buckets have been at Maurice’s for a while, but this week we saw them at the Main Street Popcorn Carts and at Storybook Popcorn. 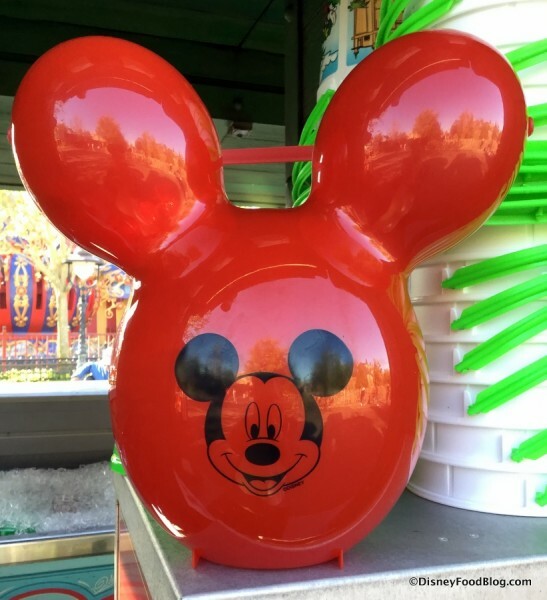 The Balloon bucket is $15.50, and $2.00 to refill it. 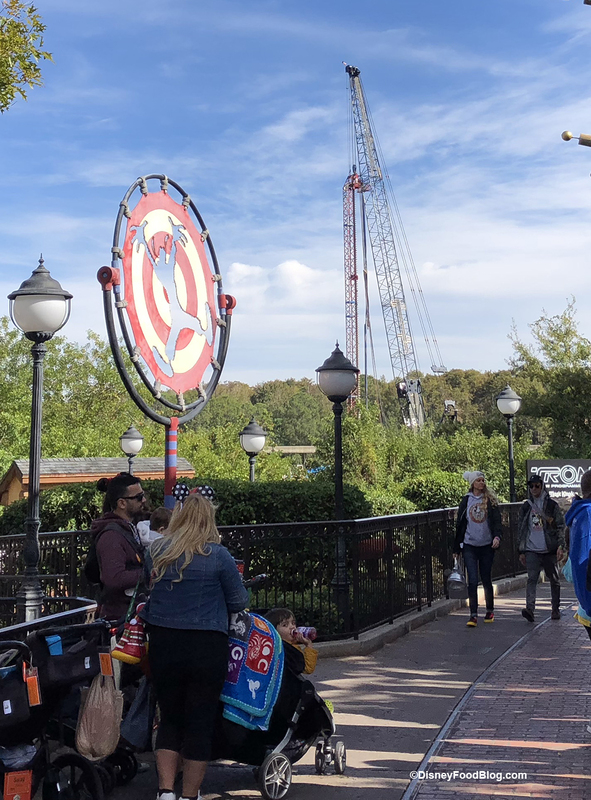 Prince Eric’s Village Market was closed the day we were in the park, but for those turkey Leg lovers out there – don’t despair. 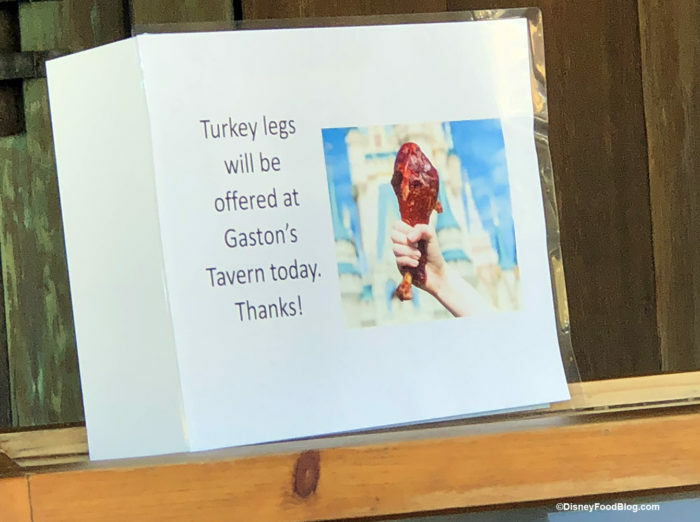 When Prince Eric’s is closed you can grab your turkey leg over at Gaston’s Tavern. 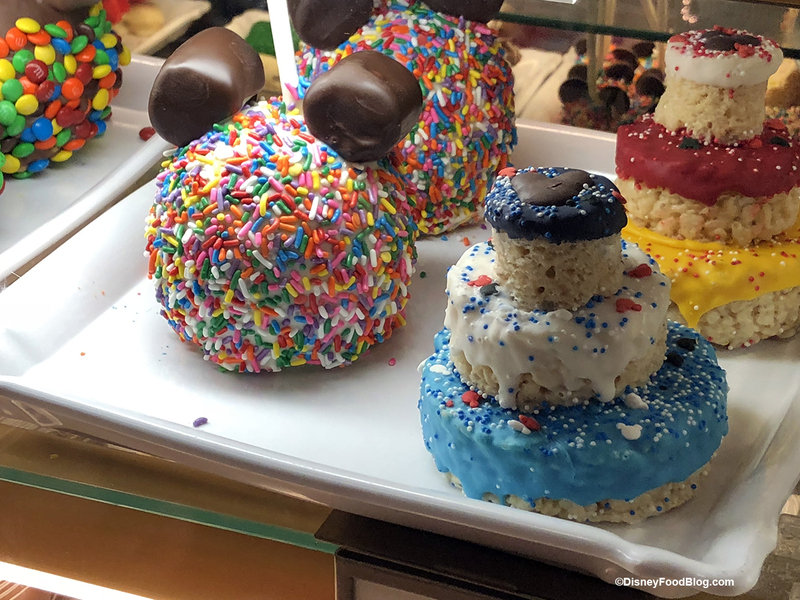 In addition to some of Mickey’s 90th treats, Big Top Treats also has some of the cutest cake pops we’ve ever seen. 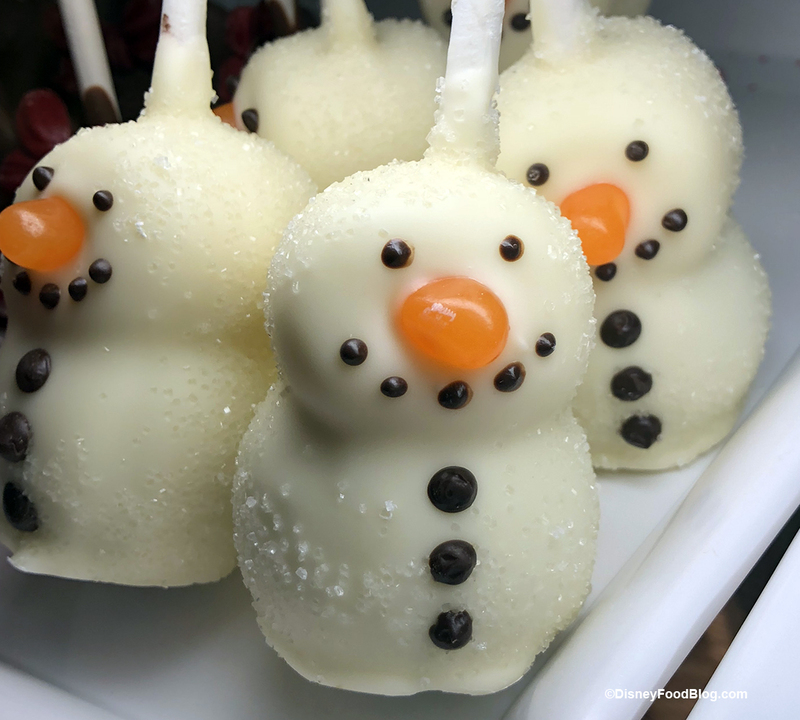 Just look at these sweet guys! 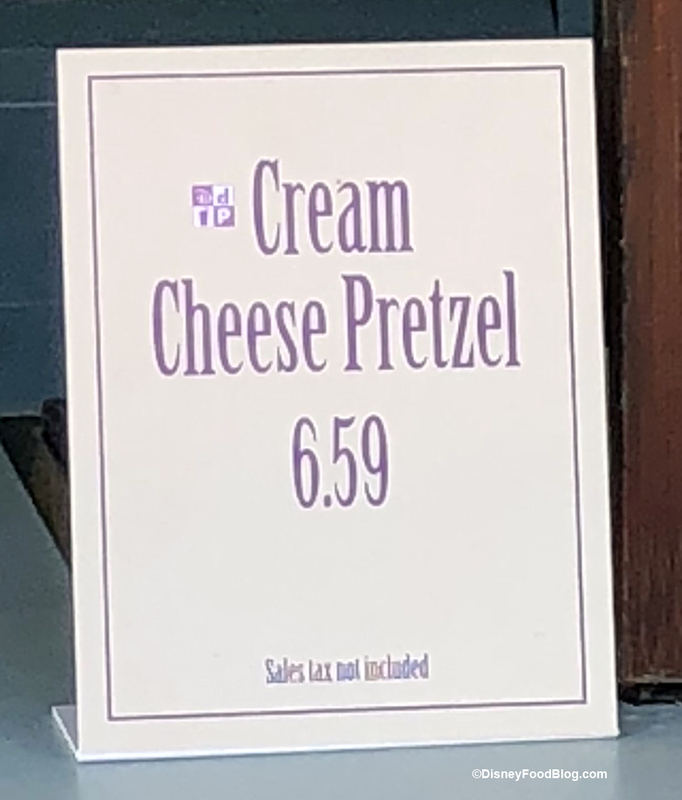 If you’re looking for a cream cheese stuffed pretzel (who isn’t?) then head over to Cheshire Cafe to get your fill of this sweet and savory snack. 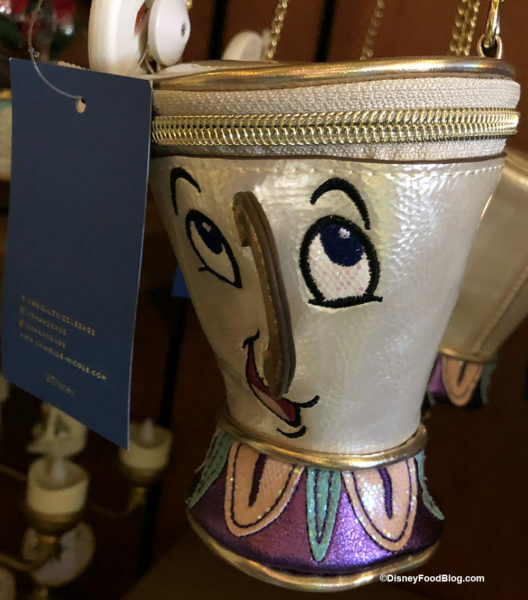 Bonjour Village Gifts is home to all things Beauty and the Beast, and now they have some must-have Danielle Nicole 3-D handbags. This Chip bag would go perfectly with the Chip Dress you can get in Disney Springs’ Cherry Tree Lane. 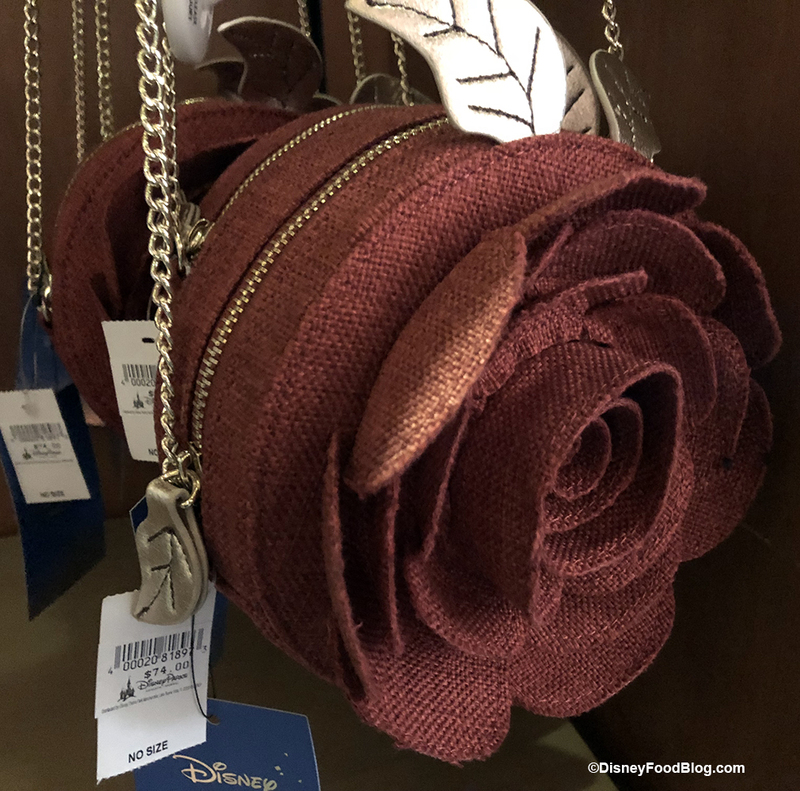 The rose bag is so elegant. Maybe we can use this to go to a New Year’s Eve bash! 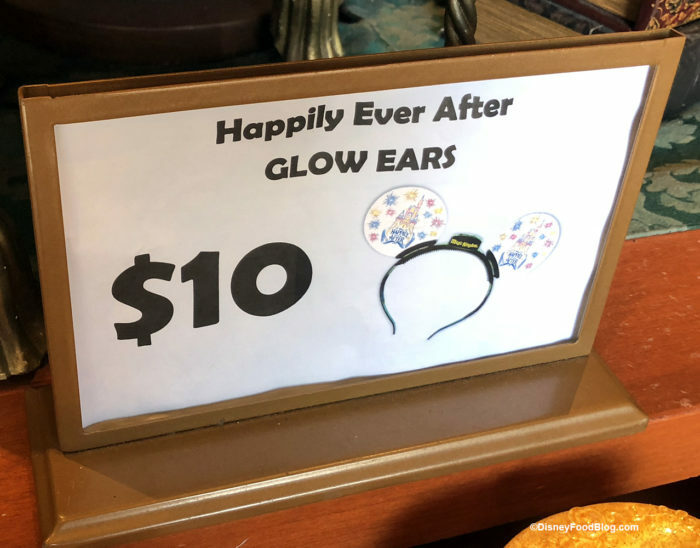 You can also grab a set of the light-up Happily Ever After nighttime spectacular Mickey Ears here for $10.00. 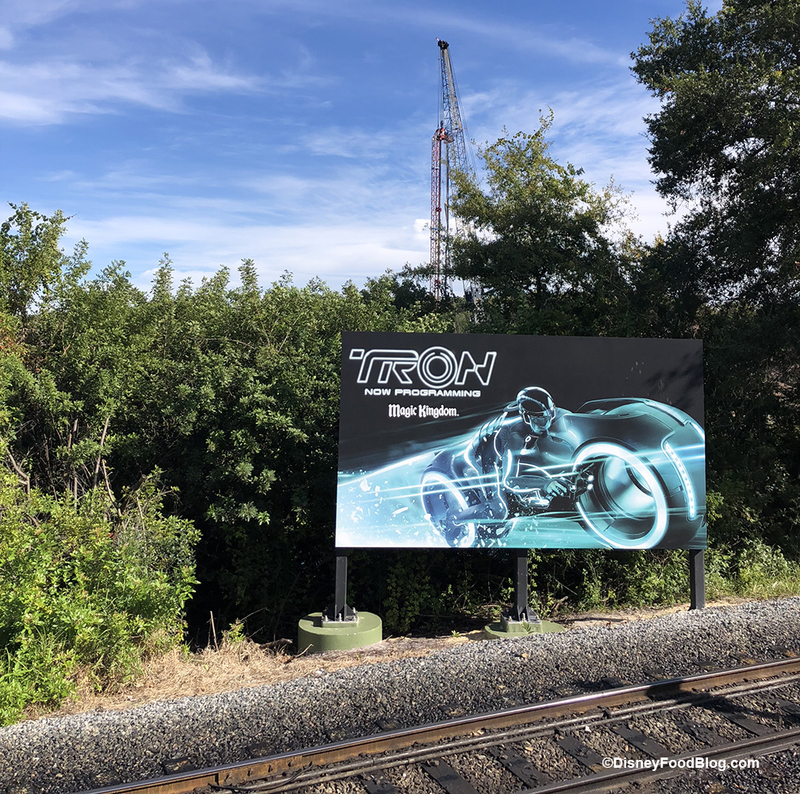 When you’re in Fanstasyland or on the path between Fanstasyland and Tomorrowland you can see signs of construction of the new Tron ride, opening in 2021. Because the construction is very close to The Walt Disney World Railroad tracks between Fanstasyland and Tomorrowland, the trains will stop running this December. During the railroad’s closure, the trains will sit “in residence” at Main Street Station. 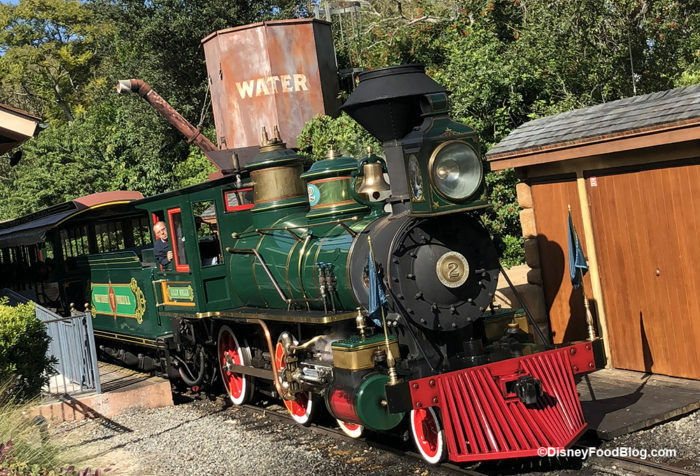 This will be a great time to get an up-close look at the trains and take advantage of some unique photo opportunities (remember to tag us @disneyfoodblog). 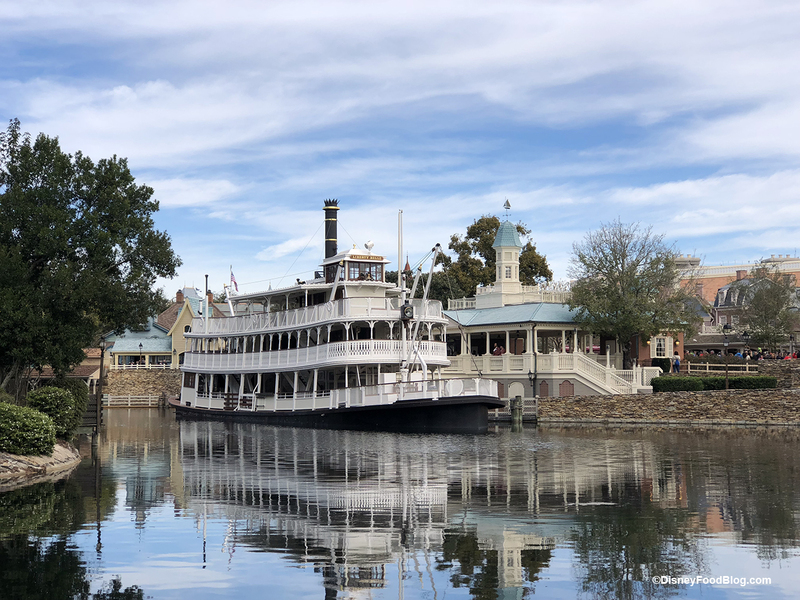 The Liberty Belle Riverboat is finally back in the station after a refurbishment of the Rivers of America, but it isn’t sailing…yet. 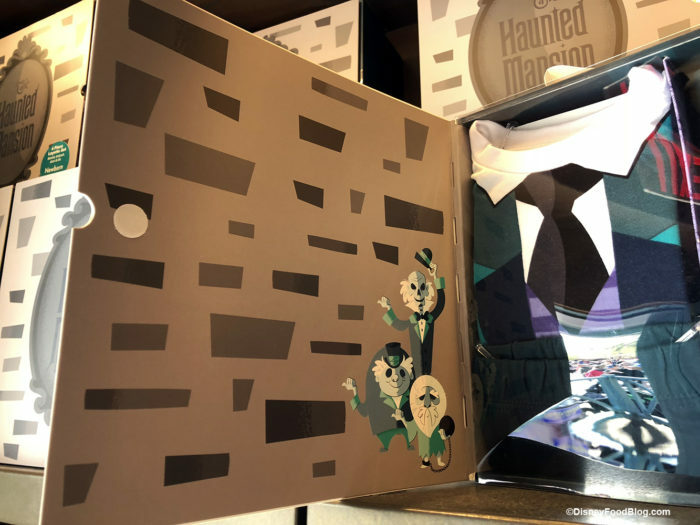 Our favorite store, Haunted Mansion’s Memento Mori, rarely disappoints us, and they didn’t on this visit. 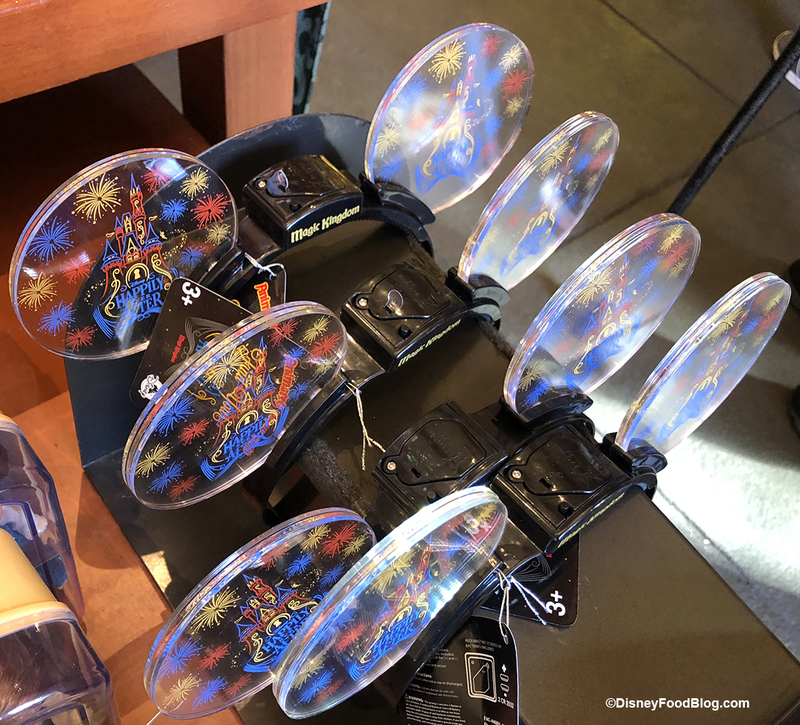 We found the Light-Up Doom Buggy Toys back in stock. 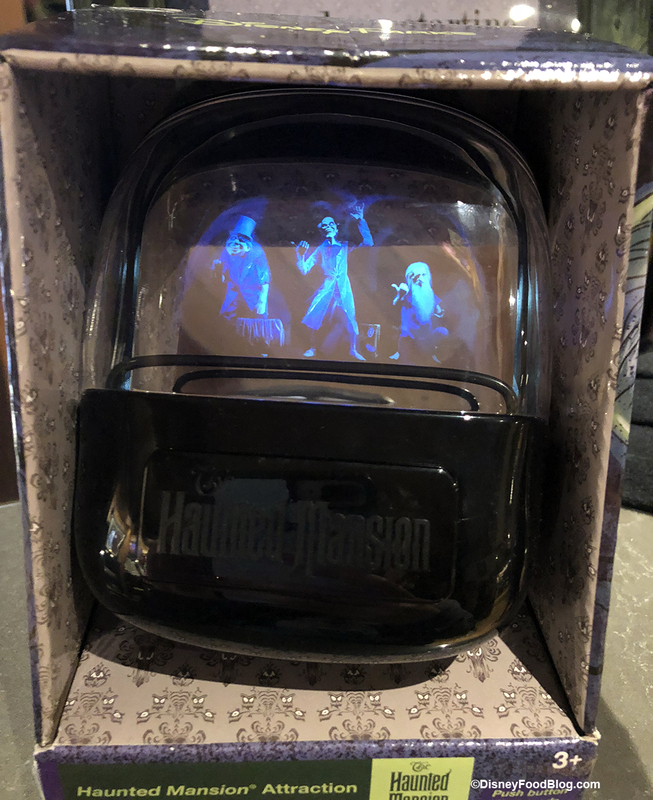 The Ghost Host says different sayings when you turn this on, and the hitchhiking ghosts glow on the screen when you push a button. 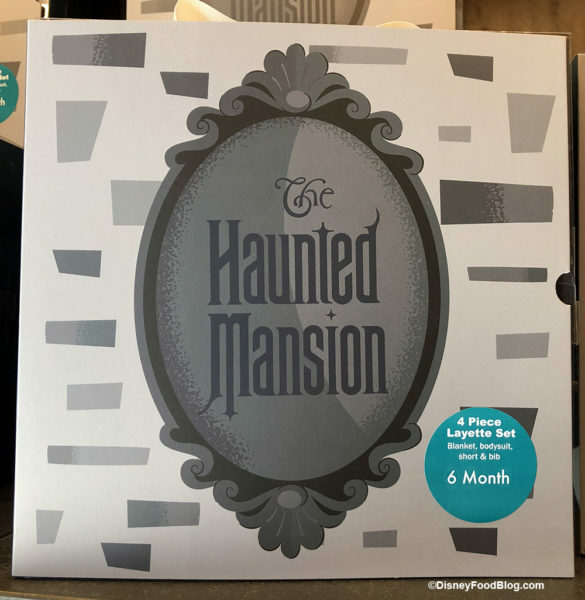 For those of you with brand new kiddos, you’ve got to check out the new layette set to dress your baby up as a Haunted Mansion cast member! The set comes in various sizes (we saw Newborn, three, and six month sizes) and includes a onesie, shorts, blanket, and bib. 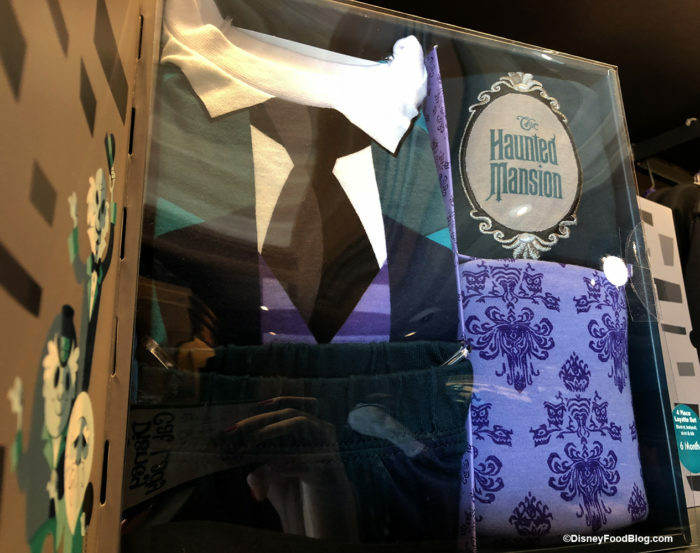 We think we’ll be seeing lots of Haunted Mansion babies next Halloween! 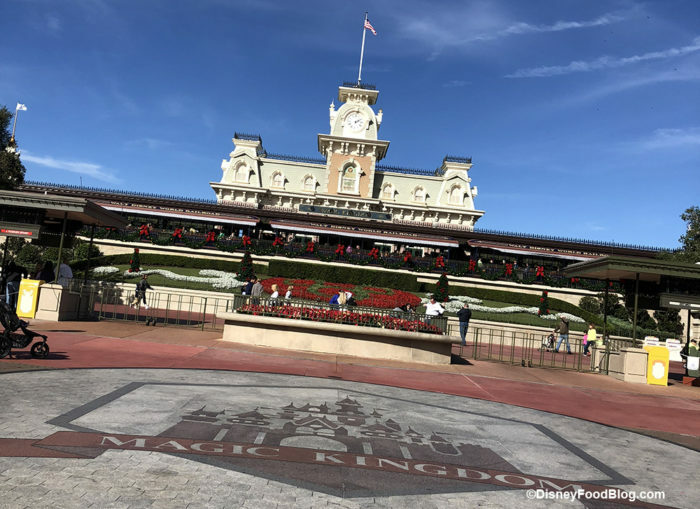 What a fun trip this was to the Magic Kingdom! 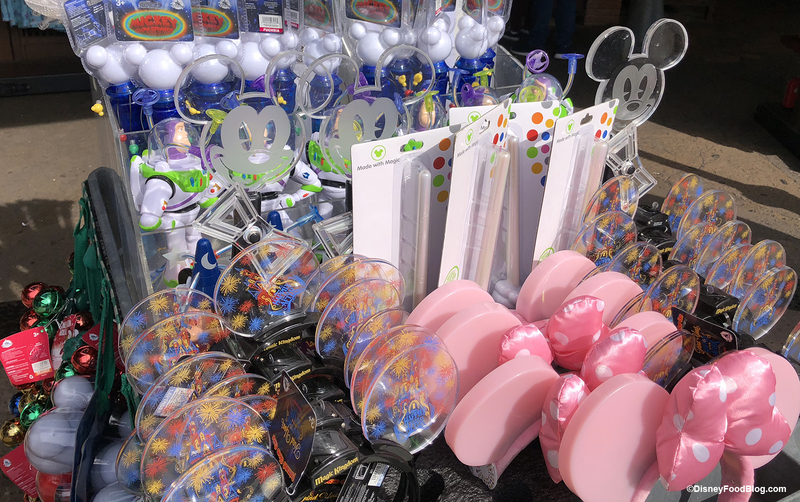 That’s all the new merchandise, eats, treats, and updates we found. 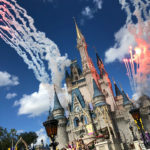 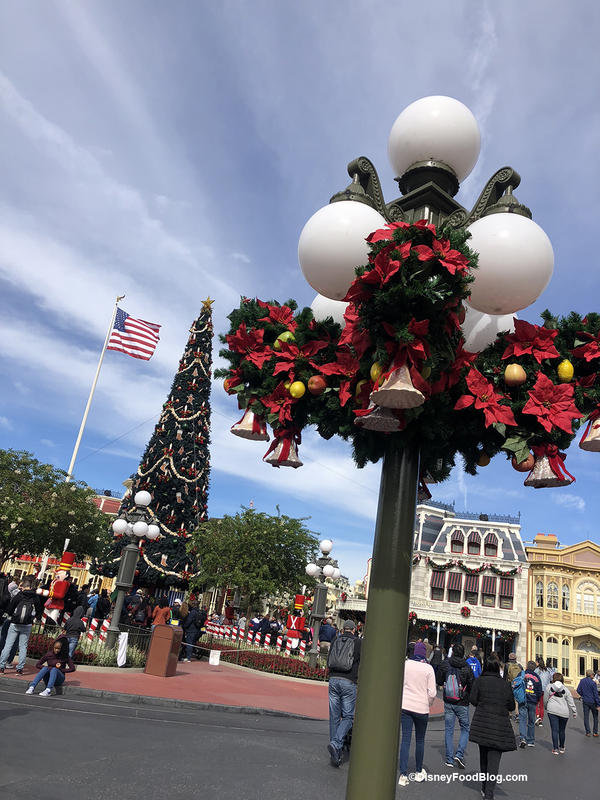 Be sure to follow us to stay updated on everything we find in the parks each week! 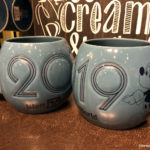 Love these What’s New blogs, always fun to read, ladies! At BOG on Thursday, December 13, the soups are no longer a DDP snack credit. Are the balloon popcorn buckets still available this year? We are going in early February. Jill, we are still seeing them on Main Street, in Liberty Square, and at Maurice’s. 🙂 Have a fabulous trip!